MC: Simon, I’m interested in your thoughts on a waistcoat pairing for my upcoming wedding. My tuxedo is single button, peak lapel (grosgrain). I have flexibility on the shirt style (wing or standard collar) and the waistcoat. Would you recommend a particular style to complement the single button, peak lapel jacket? Would a double-breasted waistcoat be out of the question under a single-breasted jacket? What about collar type and colour (black or white pique)? If you think a particular style of waistcoat would be best, I’d be interested in the style of shirt you’d pair with it as well. Thanks for your thoughts. Right, let’s start with the easy points. Most black-tie jackets have one button. So there is no specific style of waistcoat that is going to suit this style of jacket – they all will. The only thing to bear in mind is that you want the waistcoat to just peak over the top of the fastening of the jacket – not invisible but not protruding either. That will affect the height of the waistcoat you pick. There is nothing wrong with a double-breasted waistcoat. A single breast is more conventional and normal, and a double is more formal – as it harks back to the waistcoats on full fig, or white tie, which were often double breasted. As to the colour of the waistcoat, the normal and more conventional colour would be black. In the same material as the jacket, with the same grosgrain on the lapels (usually a shawl collar ending in squared-off ends). There is, however, a lot of flexibility here. The waistcoat could be collarless and it could be entirely in grosgrain. It could also be backless or not. A white piqué waistcoat would be more formal and unusual. Nothing wrong with it, but generally white waistcoats were worn with white tie and black with black tie. But then, strictly speaking you could wear a white bow tie with black tie, as counter-intuitive as it seems. Personally, I would rather like a white waistcoat as it is not incorrect and is a little different. However, the most important thing is the relationship between the waistcoat and shirt. The waistcoat is made to fit and suit a particular shirt, and this must be born in mind. So a white waistcoat, being very formal, must be worn with a stiff-fronted shirt and wing collar (also formal). Some may argue that the collar should be starched and detachable (very formal). With a black waistcoat you have a little more freedom – fold-down or wing collar is fine. Also bear in mind the shape of the shirtfront – an oval front best suits a waistcoat with an oval neckline. And a straight up-and-down, pleated shirtfront usually suits a cummerbund best – both being less formal than the options just mentioned. So the key is balancing the formality of your outfit. And match the waistcoat to the shirt, not to the jacket. You can follow the discussion on Reader question: Covering the black tie waist by entering your email address in the box below. You will then receive an email every time a new comment is added. These will also contain a link to a page where you can stop the alerts, and remove all of your related data from the site. Sage advice – and lovely pic, very stylish and “proper” – might i suggest reduction to three tenets, as someone who frequently wears evening waistcoats? One thought for the bridegroom-to-be: If you decide to wear a wing collar shirt, please make sure the collar is about 2″ tall! Most modern wing collar shirts have ridiculously short collars which flatter no one. 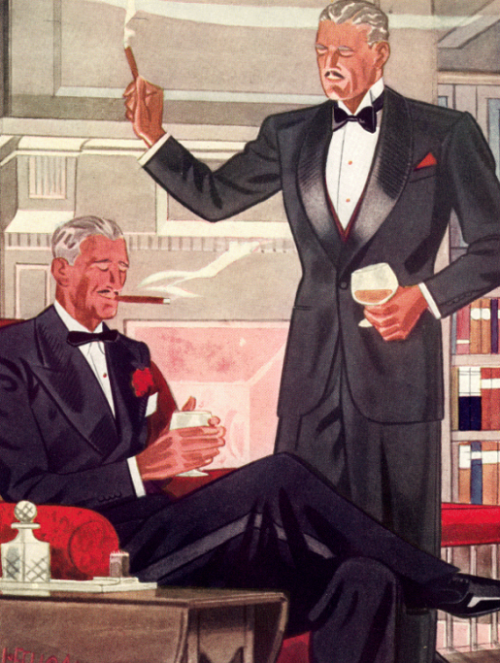 For inspiration, look at Fred Astaire, the Jeeves & Wooster series, and the Black Tie Guide. I had a two-piece tuxedo made recently for my upcoming wedding. I later decided to have a waistcoat made for it, as the same fabric was still available. The jacket is one button, peak lapel. My waistcoat will be a low-opening, 3 button shawl-lapelled number. Should the lapels be satin to match the jacket’s, or self-same fabric? Satin would be best, to match the jacket’s lapels. I’ve been informed that the company through which I am having the items made does not offer satin facings on the waistcoat. Is this going to look weird? I wouldn’t worry too much, it should be fine. It’s rare you get absolutely every option you want. It may be worth asking around other companies if you have the choice though. 1. When is it acceptable to wear formal velvet slippers with black tie? 2. If wearing a pocket square, would a while with blue field blue square look elegant and adding an element of personality when casually placed? or better to stick with a white squared off satin square? 1. When you are wearing black tie in your own home. 2. White linen is the correct choice for a pocket square. The rules for black tie evolved when men knew what looked good and what did not, when they knew what worked and what did not. We break these rules at our peril. Especially for novices, it is important to follow those rules. If you wear black tie frequently, you will learn ways to work within those rules to add your own personality to your outfit. However, the basic function of black tie is to put the man in the background so that the woman he is with will shine even more by contrast—and isn’t that a lovely thing to do? Apologies for resurrecting this old, but immensely useful post. My jacket is peak-lapeled with grosgrain, and I fancy the idea of a double-breasted black waistcoat. Would it be appropriate to have a grosgrain-lapeled db waistcoat and a piqué-bib shirt with a turned-down collar? I am constantly reminded that this blog is the only resource that I know of where the comments section is just as valuable as the main posts. Nice to hear that Dan. And please don’t apologise for commenting on old posts – we positively encourage it. I would avoid the lapel on the waistcoat to be honest. It wouldn’t necessarily be wrong, but it risks looking fussy and overdone. Thank you. Lapels are all right if I opt for sb waistcoat? Is showing any more waistcoat than the illustration at the top inelegant? Should one not see the facings of the waistcoat, only the bottom of the “V”? Finding an appropriate evening waistcoat has proved rather difficult. Starting to think bespoke is the only real option. What to do about the 1910’s-30’s specific look of sporting a white waistcoat with a dinner jacket and there is that ever so slight strip of white from the waistcoat that shows either around the collar or is not covered by the dinner jacket on the sides? My dinner suit/tuxedo dates to December 1929, and I have four full-backed white or ivory waistcoats from the 1920’s-30’s. All have the issue to some extent. Ignore it, or does it derange the look? I saw some screenshots from early 1930’s films: one with William Powell had the same issue, but what he could get away with, I can’t. Thank you for such a prompt reply! It’s an unfortunate aspect of cobbling together a vintage formal-wear outfit that the dinner suit and waistcoats came from different sources. I love my 1929 dinner suit, but it does leave the waistcoat exposed a bit much, so I will bear that in mind.